Making your own plant labels is a way to not only identify what's growing in your garden, but also to dress it up with a unique accessory. 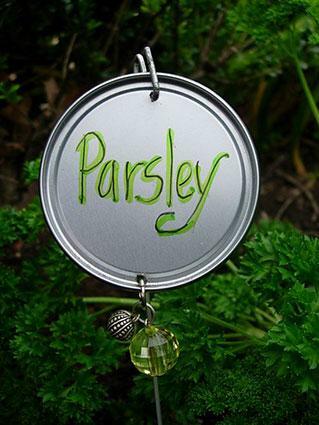 With a little imagination any number of found or recycled objects can be fashioned into a charming garden marker. This quick and easy marker project would work well in a rustic, woodsy garden. Using hand pruners, cut sticks from the garden to a length of 16 inches, making straight cuts on one end and pointed cuts on the other end. On the ends with the straight cuts, use a sharp pocket knife or utility knife to slice off a three to four-inch sliver of the wood, leaving a flat area of exposed wood about a half inch wide. This may take a number of attempts, but fortunately, sticks are easy to come by -- just remember to always cut away from yourself for safety. 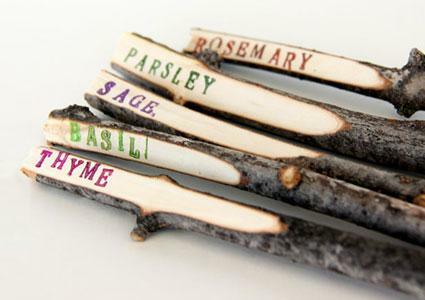 Write the names of plants on the exposed wood and push the pointed end of the stick into the ground as a marker. This innovative idea is a cross between a jewelry project and a Christmas ornament. Drill an 1/8-inch hole on opposite sides of a metal lid from a can of orange juice. Write the name of the plant on the lid with a waterproof marker. Select one or several beads and attach them to one of the holes in the lid with a piece of thin, flexible metal wire. Using pliers, open a metal coat hanger and straighten the wire. Cut the coat hanger at the mid-point and bend one end of each one into an s-shaped hook using pliers. Hang the metal lid from the s-shaped hook and push the other end of the wire into the ground like a stake. This version rests on the ground making it most effective for low-growing plants that won't cover it up as they grow. Clean off the stones if necessary and allow them to dry. 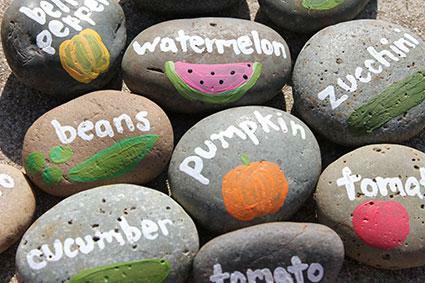 Using a very thin brush, paint the names of the plants onto the stones. White is a good choice because it shows up clearly. Decorate the remaining surface of the stones as desired with pictures of the plant or other garden-themed images. When brainstorming ideas for DIY garden markers, the first thing to consider is whether they will hold up in the elements -- they need to withstand rain, wind, and the beating rays of the sun. Second, they are most effective if elevated off the ground, whether hung from above or mounted on a post of some sort. This ensures that they remain visible as the foliage grows up around them, although there are notable exceptions, like rock markers for low-growing plants. Finally, try to think of ideas that suit the garden space they will be used in or the plants they will be used to identify. Consider the marker as part of the overall garden design in terms of the colors, themes, and materials you choose to work with. These are just a sampling of the many types of garden markers that can be quickly made from items found around the house and yard. They're a great activity to share with children and one of many examples of whimsical garden décor.